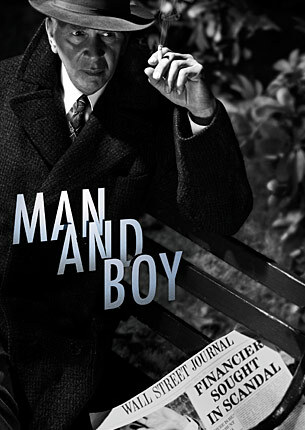 The Rondabout Theatre Company has mounted a revival of Terence Rattigan’s Man and Boy. For those with a pressing engagement or abbreviated attention span, I will cut to the chase: it is phenomenal. Frank Langella (‘nough said?) stars in this drama set in Greenwich Village in 1934. Directed by Maria Aiken, the fluid and balanced action unfolds in real time one October evening. Man and Boy, written in 1961, feels terribly modern both in its storyline and style. Langella’s character, Gregor Antonescu is an international financier, credited with resuscitating the European markets after World War I. He is debonair, larger than life, steely, and by his own admission, without conscious. Things have come to a bit of a nasty head for G.A., as he is known to his trusty assistant Sven Johnson (Michael Siberry) who bears a second cousin resemblance to Max in Sunset Boulevard. Sven seeks out the Greenwich Village apartment of G.A.’s estranged son Basil (Adam Driver) for a clandestine business meeting. Basil has denounced his lineage and lives as a piano playing socialist in a dreary basement apartment (designed by Derek McLane.) Underneath the thin layer of his disguise is Basil’s adulation of dear old dad. Not surprisingly G.A.’s impulse upon seeing his son for the first time in five years, is to offer the young man to his closeted business adversary. Prostituting one’s young, does not earn any parenting awards, but it feels completely in character for G.A. There is nothing surprising about the turn in the story, yet it must be said that the matinee audience (of a certain age and with just a hint of bridge and tunnel A.O.C.) giggled nervously with the implications. This storyline is not meant to be funny, and in 1934 Greenwich Village socialist circles, homosexual activity would not be unknown. I suspect a different audience would have a different response. The cast is perfectly balanced out by Basil’s girlfriend Carol (Virginia Kull,) the business nemesis Mark (Zach Grenier) his accountant Beeston (Brian Hutchinson) and G.A.’s second wife the (purchased title of) Countess (Francesca Faridany.) The relationships and interactions between these characters is completely thought out and believable. Most of us won’t commandeer a basement apartment in an attempt to rescue our international financial empire, but we can relate and understand the words and actions of all of these characters. That is the mark of truth in writing. This production has an overall British feel to it, no accident considering the lineage of some of the creative team. There is a simple intelligence to the production that this play richly deserves. There are plays that take (well rewarded) effort on the part of the audience. I love Martin McDonagh, but you better not blink for 2 hours or you will be lost. Additionally, plays steeped in symbolism can be a delicious intellectual exercise. But there is something to say for clean, emotionally true drama. And when it’s exquisitely executed, it is a must see.